The Wire remastered in HD: David Simon writes blog post on what is lost and gained in the process (VIDEO). 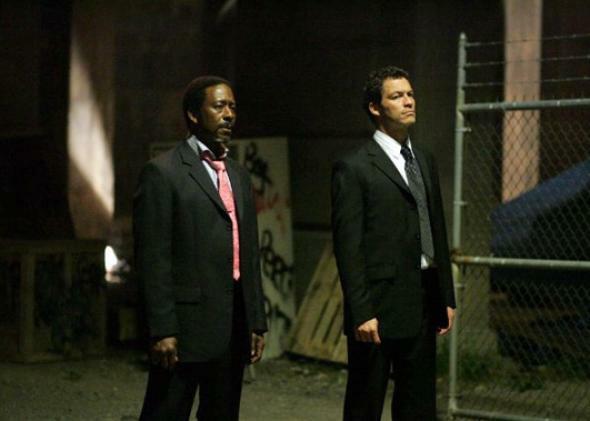 Clarke Peters and Dominic West in The Wire. Photo by Paul Schirald/HBO, Inc. Slate is celebrating HBO’s marathon broadcast of the remastered The Wire by republishing some of our best coverage of the show. This article, originally published earlier this month, is reprinted below. As full wide shots in 4:3 rendered protagonists smaller, they couldn’t be sustained for quite as long as in a feature film, but neither did we go running too quickly to close-ups as a consequence. Instead, mid-shots became an essential weapon for Bob, and on those rare occasions when he was obliged to leave the set, he would remind me to ensure that the director covered scenes with mid-sized shots that allowed us to effectively keep the story in the wider world, and to resist playing too much of the story in close shots. Colesberry died before shooting began on the third season, and soon HBO gave permission to shoot the rest of the series in widescreen. Simon explains that he and the other creative minds involved decided against this, because they wanted to maintain a cohesive aesthetic across seasons. Other scenes, like one involving Wee-Bey and D’Angelo Barksdale, had to be re-evaluated and refocused in order to work as well as they did before. Simon and Noble did not have time to go through every scene as meticulously as they would have wanted to, so they entrusted Wire editor Matthew Booras to review the entire series and make the necessary adjustments. Simon admits that, inevitably, “there are some things that are simply not as good.” But he’s also “satisfied” with this alternate version and hopes that the new format will bring more viewers to the series who have been previously turned off by the 4:3 aspect ratio. With the kind of thought and care Simon and co. have put into the new version, perhaps we shouldn’t be too worried about this new format and should instead wait and see. Correction, Dec. 3, 2014: Due to a production error, the photo caption on this post originally misidentified Clarke Peters as Isiah Whitlock, Jr.